But it’s no joke – it’s what farmers and ranchers are having to tell pinheads in the State of California who are trying to curb emissions of methane – produced primarily by bovine flatulence. Because bureaucratic nitwits love confusing jargon, they don’t call cow farts “cow farts,” they’re calling it “enteric fermentation” and they want the state’s 5.5 million beef and dairy cows to hold it in. The methane produced doesn’t linger in the atmosphere like carbon dioxide does, but experts say that it’s 25 times more potent as a “greenhouse gas,” The Guardian is reporting. Of course, it’s ironic that the state would try to limit cow farting when they took almost four months to cap a natural gas leak that spewed 97,100 metric tons of methane into the atmosphere (that’s as much methane as 100 million cows produce in one year, by the way). With 5.5 million cows in California, it would take almost 20 years for the cows to produce as much methane as was released in four months. The California Air Resources Board has set a goal of reducing methane emissions by 40 percent by 2030. Of course, the state’s dairy industry has called the new rules idiotic. 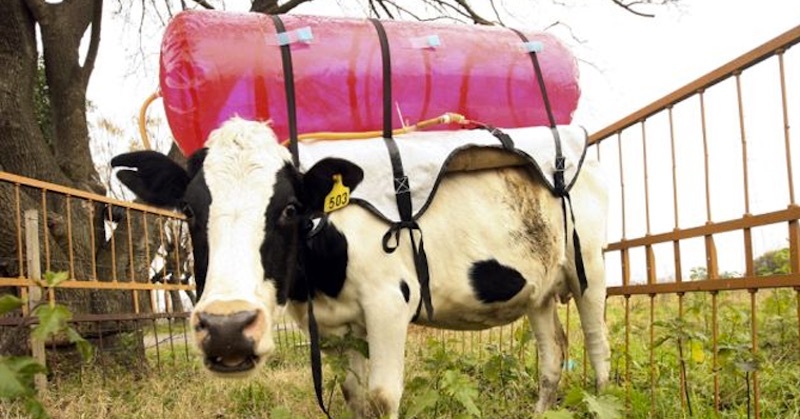 The Argentinians have come up with a novel idea: cow fart backpacks. Scientists down there developed a system that places a catheter tube into the butts of cows to collect any methane produced that goes into an inflated bag (why it has to be pink, I have no idea), then the gasses are collected and used as an energy source. It’s the dumbest thing I’ve ever seen, but given what Barack Obama is doing here, I wouldn’t be surprised if there’s another executive order coming down the pike on this. California’s decision follows some idiotic executive orders by Obama intended to cut methane emissions from the oil and gas industry by 45 percent in the next 10 years. He’s also going after refrigerators and air conditioners.